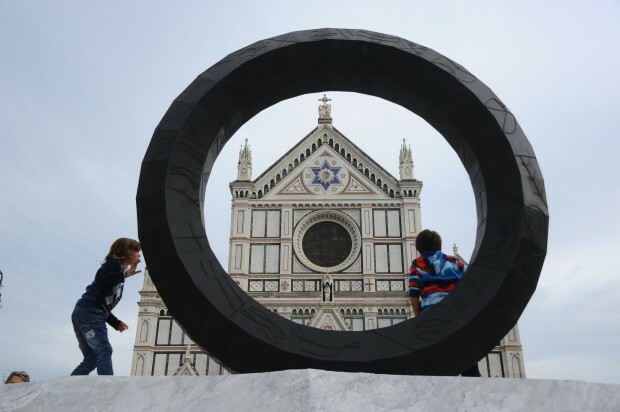 The Uffizi’s new exhibition, Figures, Memory, Space. 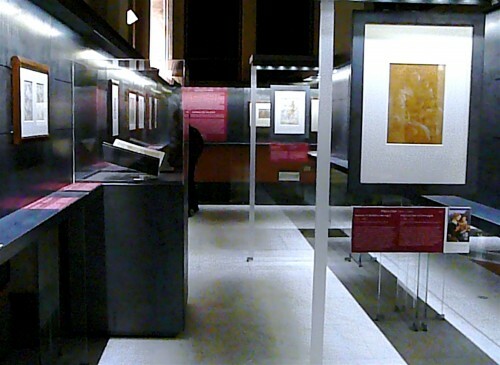 Drawings from Fra Angelico to Leonardo, displays over 100 works by Fra Angelico, Botticelli, Leonardo da Vinci, Mantegna, Michelangelo and Titian. It shows how drawings were used to prepare for major paintings and frescoes and, later in the 15th century, how they became works of art in their own right, particularly with the arrival of print-making from northern Europe. 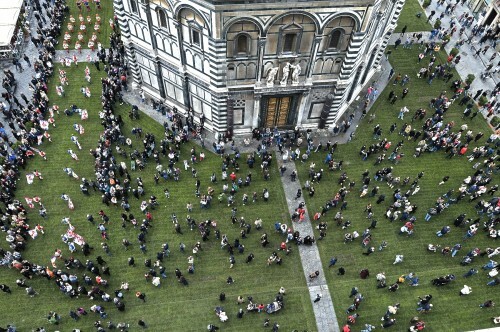 The Florence show, divided between two Uffizi locations, combines works from the British Museum’s collection and from that of the Uffizi. Last year it opened to rave reviews in London. 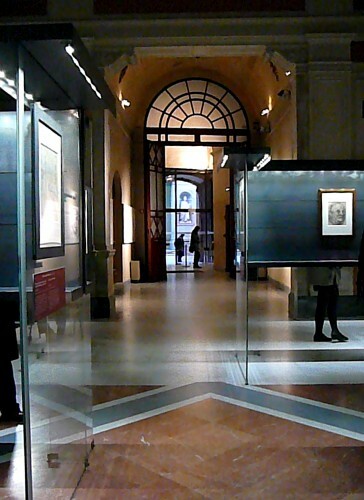 Fifty prints are on view in a free exhibit in the Reali Poste exhibition space off of the Uffizi courtyard. A simple labiranth was created so that each of the sketches can be viewed in its own space and also offers a sense of privacy to the viewer. 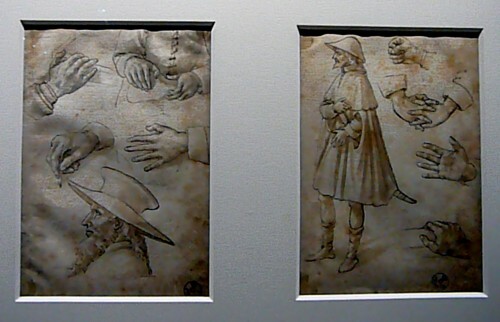 Alexandra M. Korey best describes the emotional experience of seeing the original sketches of Leonardo da Vinci for the first time and enumerates three reasons you must visit the Reali Poste exhibit. Read her post on arttrav.com. 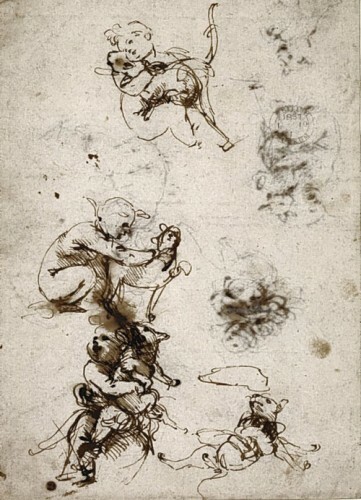 In addition to the detailed and exquisite pictures of figures, limbs and drapery, there are fast, rough sketches by the likes of da Vinci who used pen and ink drawings as a way of brainstorming and arriving at ideas for major works, some of which you will remember from past visits to the Uffizi. “One can sense the excitement as their quills raced over the paper to keep pace with the flow of ideas,” said British Museum director Neil MacGregor about the London exhibition. Consider Leonardo’s studies of The Virgin and Child with a Cat. A cat? Where did that come from? A cat had no emblematic place in the traditional iconography of such a votive subject — a lamb perhaps, a bullfinch too, even two cherries on a bifurcated stalk to symbolise Christ’s testicles and his wholeness as a mortal man — but not a cat. Leonardo must have seen a cat squirming in the arms of a child, in turn in the arms of a kneeling girl, and recognised in the complication of the momentary torsions of three very different bodies a subject as difficult to pin down as the swirling waters of a whitewater river. The pen cannot move as rapidly as the model, nor record as swiftly as the eye and memory, and everywhere there are overdrawings and corrections. We cannot determine which of the five studies was first to develop on the sheet — they were probably all preceded by eight studies on another double-sided sheet — for it is only with the introduction of the Virgin that we sense the composition of a painting forming in Leonardo’s mind, a composition that in still other sheets developed into an arch-topped panel that in closely confining the energy of the group enhances it. The painting, alas, was never executed, and the drawings now act as records of what might have been. In the beginning was the line and in this case that must be enough. Most of the works on display were never intended for public exhibition although today they would be considered masterpieces. 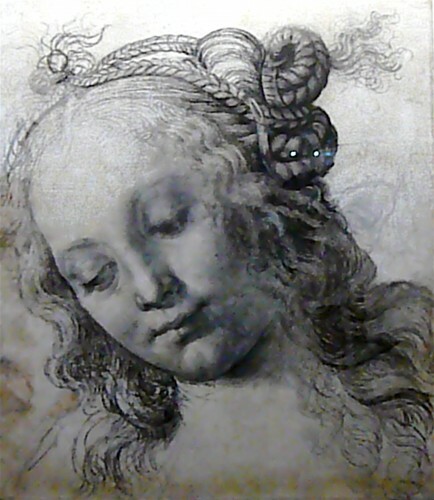 A drawing by Raphael for a work commissioned by Pope Julius II in the early 16th century, sold in December 2009 for $47.9 million at Christie’s, a world record for any work on paper. The excellent signage of Figures, Memory, Space. Drawings from Fra Angelico to Leonardo, both Italian and English, describes how the invention of paper, a cheaper alternative to vellum, was key to drawing’s development and distribution. The ever-expanding trade with the Far East is said to have changed the tools and colors of inks, the black, gray, red and white lead, silverpoint, metalpoint, the stylus, chalks, charcoal, and watercolors. Once you have enjoyed the free view of 50 incredible designs dating from the 14th to 16th centuries, you can pay 15 euro for a reserved ticket to the Uffizi. Half-way up the arduous stairs to the main gallery, you can pause for breath and view more than 50 more in the Gabinetto Disegni e Stampe on the Uffizi’s first floor, including prints that the Londoners did not get too see because they are deemed too precious to leave the gallery. Graffiti is known worldwide, but word itself has nothing to do with scrawls on walls. In Italy, the words sgraffito and sgraffiti come from the Italian word sgraffiare (“to scratch”), ultimately from the Greek γράφειν (gráphein), meaning “to write”. Graffiti, the bane of all modern cities in the form of spray paint, in its original sense refers to marks scratched onto a surface with a tapered point. The graffito technique has been used since prehistoric times. Decades ago, my father showed me graffito animals, birds and people carved on the tufa cave walls in northern New Mexico. 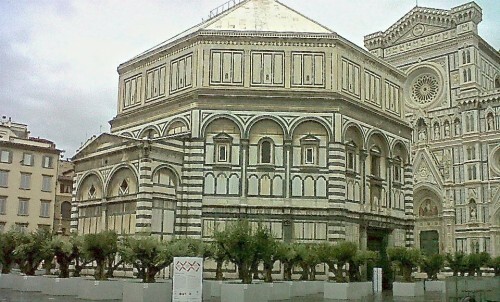 But in Florence, starting in the 1400s, it was a technique of wall design, where the top layer of pigment or colored plaster is scratched through to reveal an underlying layer. 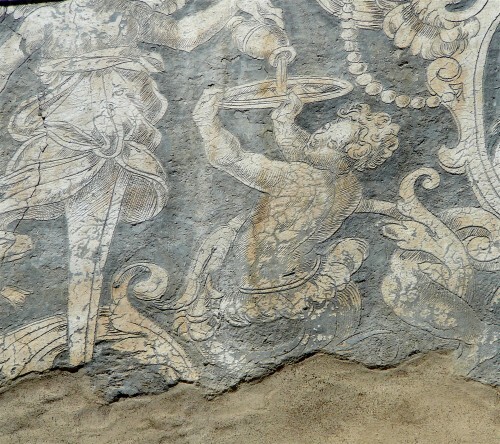 My favorite examples of historic graffiti in Florence were created during the second half of the 16th century, when the graffito technique was used to design Mannerist allegories incorporating grotesque (meaning in the style of the “grotto”) designs and figures. 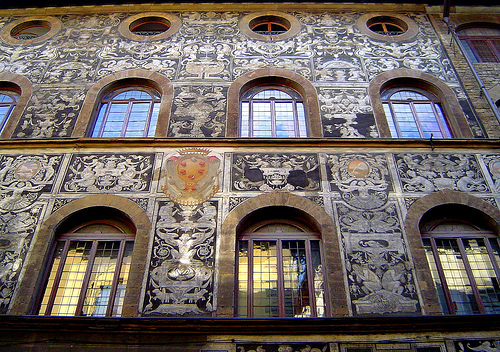 These are still partially visible on the façade of the Palazzo Ramirez de Montalvo in Borgo degli Albizi and fully realized on the House of Bianca Cappello (grotesque sgraffito decoration by Bernardino Poccetti, 1566) on Via Maggio. 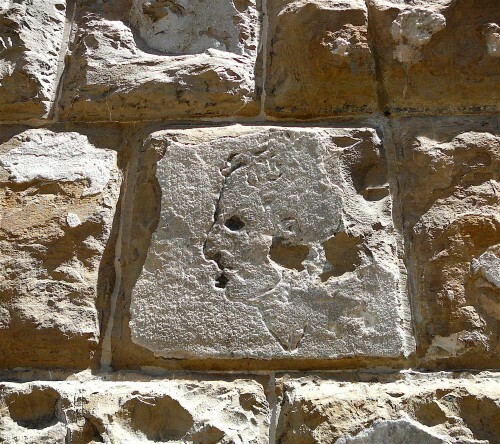 When using the term graffiti to mean defacing buildings, Michelangelo has the dubious pleasure of allegedly being one of the first famous graffiti artists – not with paint, but in the caveman version of scratching a design with a sharp point. On the corner of the Palazzo Vecchio, the one nearest to the Uffizi Gallery, any visitor to Florence can find a carving of a man’s face. 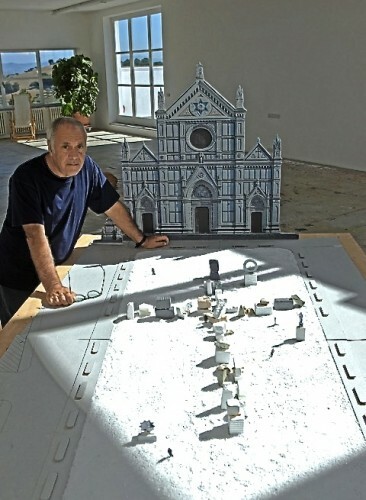 Did Micheangelo deface the front of the Palazzo Vecchio? 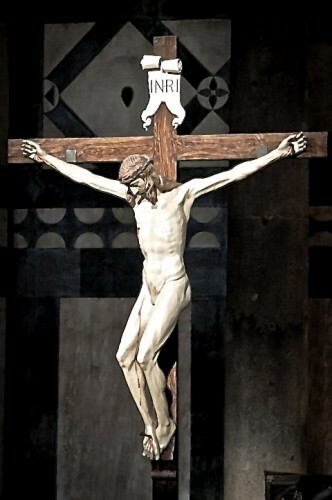 There is more than one version of the story, but the artistry is attributed only to Michelangelo. One version states that ever willing to take a dare, and supremely confident, Michelangelo turned his back, carving free-hand without looking, into the pietra serena of the city hall’s wall, he etched his own profile into the stone. Another variation has it that he carved blindly the likeness of a personal foe, so that Florentines would never forget the man’s face. 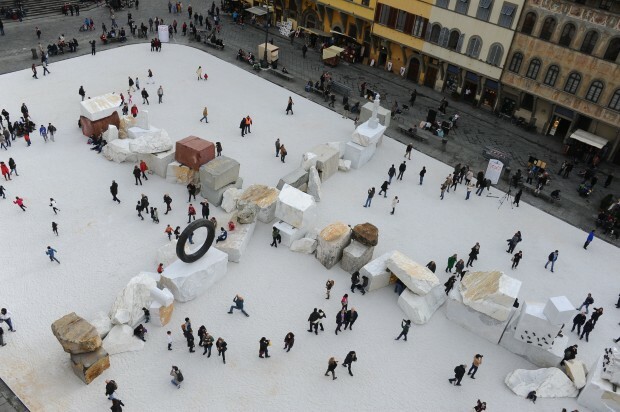 Last week, a one-day comics festival, OPEN YOUR EYES TO Comics DAY, came to Florence. 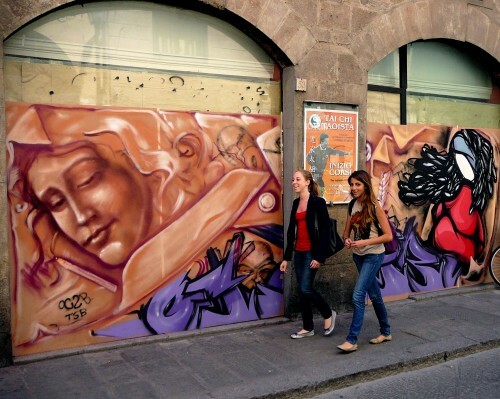 Via del Corso was decorated with four modern graffiti wall decorations – sanctioned by the mayor. These were not scratched into walls, but painted on to wallboard. They won’t last 400 years, but they are better than the scourge that defiles most of Florence’s walls. The Laurentian Library (Biblioteca Medicea Laurenziana) in the cloister of the Church of San Lorenzo is not a library where the visitor to Florence can hang out in comfy chairs, but it is one of the most important libraries in Florence – well worth a visit. The Laurentian was designed by Michelangelo and houses one of the largest neo-classical collections in the world. It is used today by scholars. 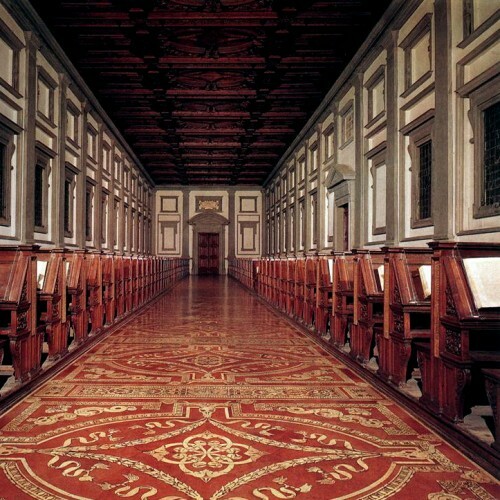 The Laurentian Library was commissioned in 1523 by Giulio d’Medici, who became Pope Clement VII. Michelangelo came under intense pressure to work quickly; the correspondence between him and Pope Clement is said to be one of the most fascinating records of a creative dialogue between a 16th century patron and an architect.Construction began in 1525, but when Michelangelo left Florence in 1534, only the walls of the reading room were complete. 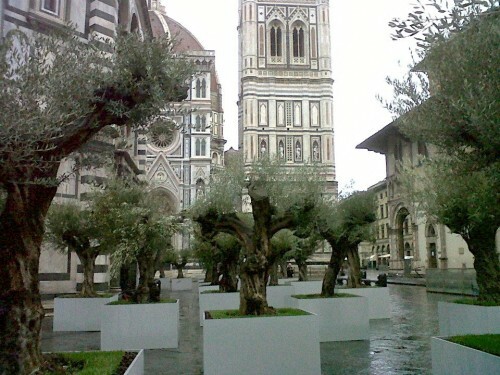 Architects Tribolo and Ammannati continued the project, based on plans and verbal instructions from Michelangelo. The library opened in 1571 and is one of Michelangelo’s most important architectural achievements. The vestibule, a large box-shaped entry (19.50 meters long, 20.30 meters wide, and 14.6 meters high), was built above existing monastic quarters with its entrance on the upper level of the cloisters. 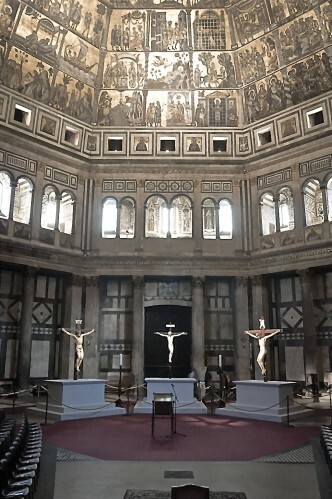 Originally, Michelangelo had planned for a skylight to allow more light into the Library’s entrance hall, but the Pope believed that it would cause the roof to leak, so a high band of windows was incorporated into the west wall. Solely for decorative purposes, blank tapering windows, framed in gray pietra serena, circumscribe the white interior of the vestibule, separated by paired columns set into the wall. There may have been a carved wooden ceiling (matching that in the Reading Room) planned for the entry hall, but today the area is covered in a canvass painted to look like intricately carved wood. The lower half of the vestibule is virtually filled with an out-sized staircase that announces the importance of the Library. 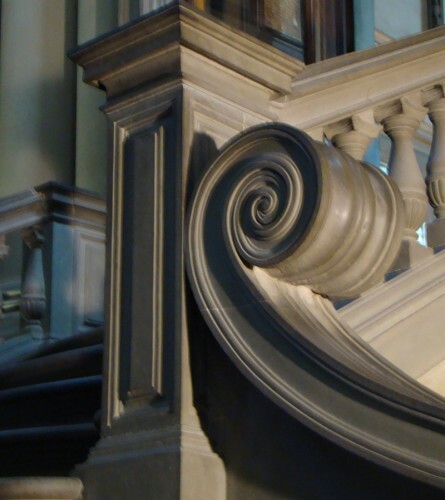 This is the singular most popular part of the Library for most visitors – one of the most famous stairways in the world. The planned design of the stairs changed dramatically over time. 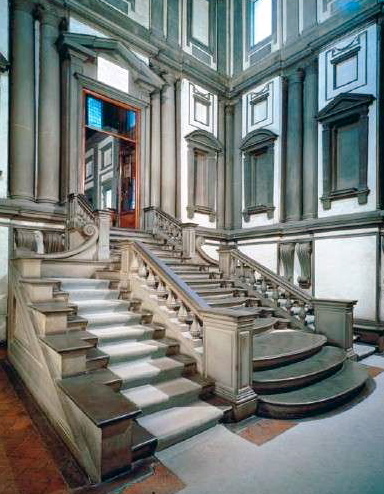 Originally in the first design (1524), two flights of stairs were placed against the side walls and formed a bridge in front of the reading room door. A year later the stairway was moved to the middle of the vestibule. Tribolo attempted to carry out this plan in 1550, but nothing was built. Ammannati then took on the challenge of interpreting Michelangelo’s ideas to the best of his ability using a small clay model, scanty material, and Michelangelo’s instructions. 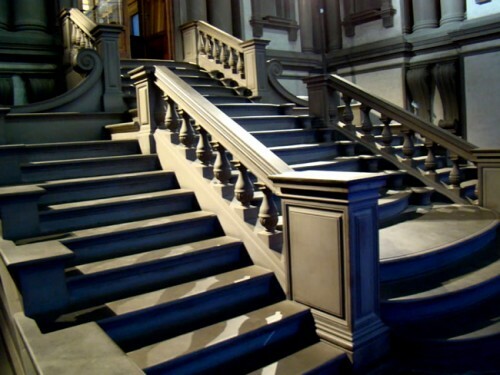 Reportedly, Michelangelo envisioned the stairs to be made of a dark wood, but the final construction incorporated fine-grained sandstone, pietra serena, quarried in Fiesole, near where Michelangelo lived as a small child. Michelangelo created this sketch for the door between the vestibule and the Reading Room. 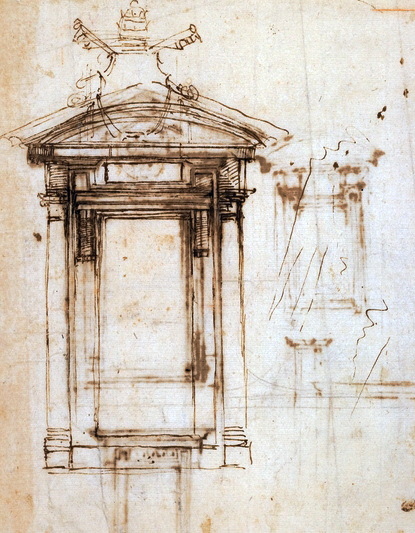 One side of the original sketch shows the side of the door visible from inside the library, while the vestibule side is shown on the back of the page. The door needed a blank panel above the opening for a dedicatory inscription on the vestibule side and this is shown in all the sketches. 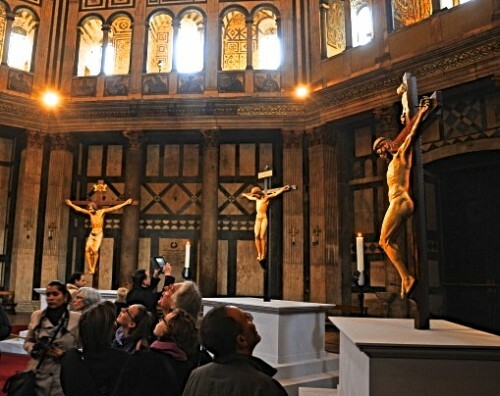 In the finished design, more space had to be found as Clement wanted a Latin inscription of between 100 and 140 letters (Twitter – inspired by Michelangelo and the Pope?). The long narrow Reading Room runs the full length of one side of San Lorenzo’s square cloister. There are two blocks of bench seats separated by a center aisle with the backs of each serving as desks for the benches behind them. 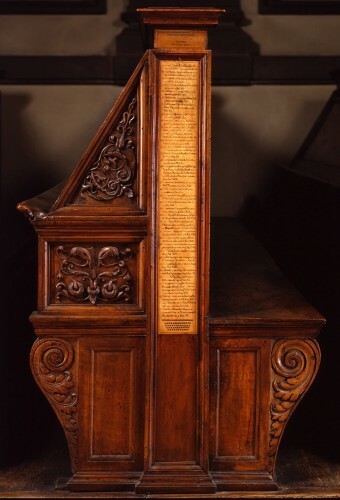 At one time, large illuminated manuscripts were chained to the desks to discourage theft. The Reading Room is well lit by the stained-glass windows that run along the both walls. The newly restored windows display the crest of the Medici. The wide central aisle between the desks is made of large creamy white and burnished red terra cotta tiles in geometric designs. Mid-way down the Reading Room, the desks on the right side are separated by a short walkway that ends at the entrance of a square, vaulted domed room, now used for conferences and meetings. The Laurentian Library houses one of the most important and prestigious collection of antique books in Italy. The humanistic interests of Cosimo de’ Medici (Cosimo the Elder) in the early 15th century led him to collect manuscripts from all over Europe, as well from Greece and the Middle East. 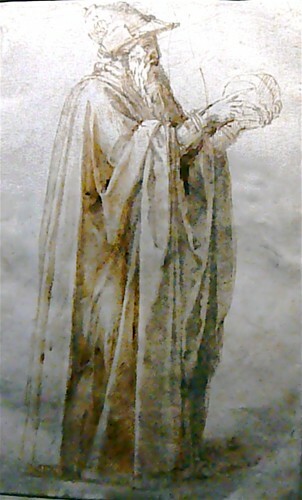 His friendship with Niccolò Niccoli, with whom he shared a passion for collecting ancient manuscripts of the works of classical authors, resulted, in 1437, in the inheritance of most of Niccoli’s library. Cosimo’s son Piero added more volumes and his grandson Lorenzo (the Magnificent) completed the collection with the acquisition of hundreds of Greek texts. The library, although kept largely intact, weathered the trials and tribulations of the Medici family. 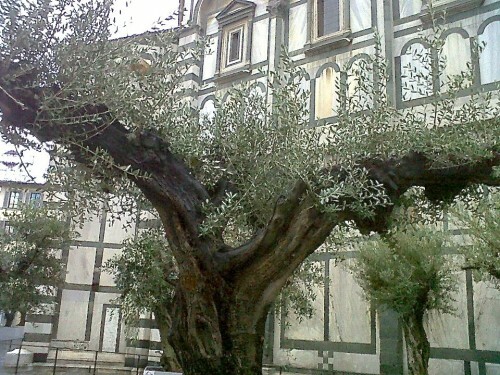 In 1494, following the sentence of exile imposed on Lorenzo’s son Piero (the Unfortunate), and thus, the banishment from Florence of the whole of the Medici family; the library was confiscated by the city government and absorbed into the library of the San Marco monastery. In 1508, the collection was recovered by Cardinal Giovanni de’ Medici (the second son of Lorenzo the Magnificent, who later became Pope Leo X) who transferred it to Rome. His successor Clement VII (Giulio de’ Medici, son of Lorenzo’s brother Giuliano) brought the collection back to Florence in 1523 and immediately commissioned Michelangelo to design a library to house it. Usually, there is a curated exhibit of historic books from the Laurentian Library on display in space adjacent to the Reading Room. The current show is Díaita. 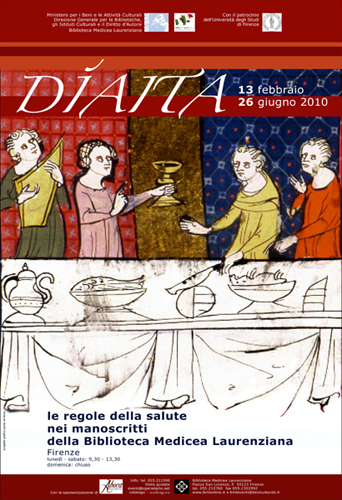 Le regole della salute nei manoscritti della Biblioteca Medicea Laurenziana (historical books about diet and the rules of health). Past exhibits have included monsters and fantastical creatures found in illuminated manuscripts and the historical “shapes” of books, including papyrus and scrolls.